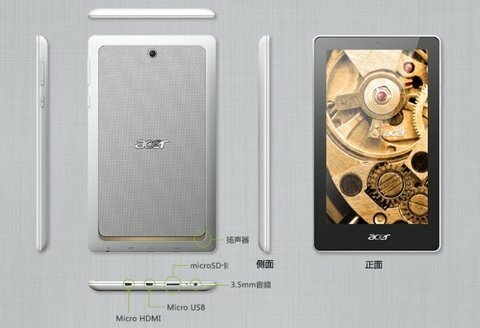 Acer has not announced the ACER TAB 7 yet, but the device has been listed on a Chinese online retailer with a price tag of 600 Chinese yuan. As the tablet is listed on Chinese retail website, though official global launch plans can’t yet be ruled out. The Acer Tab 7 has 7 inch screen with a 1024 x 600 pixels resolution and runs on Android 4.2 Jellybean operating sytem. The tablet gets the strength from 1.5GHz dual core Cortex A9 processor paired with 1GB RAM. The TAB7 has WiFi, Micro USB port with OTG support and micro HDMI connectivity. It packs with a 3MP rear camera and 1.9MP front facing camera. It comes with 8GB of internal storage and houses 3000mAh battery. It measures 191 x 112 x9.9 mm and weighs 289 grams.